I have exciting news, a while ago I went to meet the creator of Frock, an online boutique, for a coffee and chat with the prospect of joining their team as a PR intern. In my eyes the meeting went well, I love Frock and everything they stand for and offer. I am their new little intern, I get to work from home and I get to help with everything and organise my own little project. Exciting. 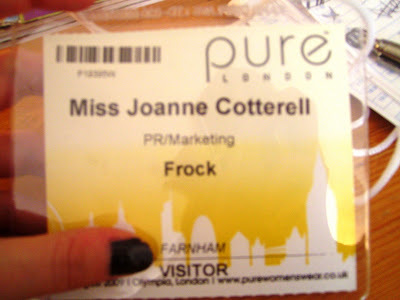 Anyway one of the ‘perks’ of the intern is that Rachel the creator sent me two tickets to attend Pure London at Olympia. I went for a tribal/ jungle look. Which wasn’t my obvious intention it just kind of happened. I was having one of those days when I couldn’t find anything nice to wear. I have many clothes but none of them looked right which I find really annoying. I haven’t worn this top in ages, it was a great find a few years ago at River Island. I don’t normally wear orange or yellow but the intense colours and sequin detail were a sure winner. Yes, I really really did, and I hated it. I bet they were more welcoming to me too because I had 'buyer' on my tag. I hate all this pretention in fashion. And the thing is, I've seen it much worse at other shows, and with labels that aren't particularly well established and in my opinion can't afford to alienate customers. If I ever come across people like that, I immediately put them on my 'never do business with' list! It has a suprisingly large amount of people on, haha. I don't know, maybe I'm alienating myself by doing it, but I don't see what's wrong with doing things with a drop of honey, instead of all this uptight nonsense. I don't remember seeing Lucy sunshine…will have to look them up. Old Romantic were so so pretty, and the girls on the stand were really lovely too. I ordered some of their fabric rings and earrings too, thought they were adorable. It's just too exciting opening a boutique, but it's extremely stressful, I'm such a perfectionist and am so picky about every tiny detail. I'll be posting my little journey as I go along! Well done on becoming their new intern anyway…what kind of things will you be doing? They're so rude aren't they, it's really shocking, you'd think they'd be on their best behaviour trying to promote their brands! I had one man who looked me up and down, and against my better judgement I asked him a couple of questions, he replied, but in a kind of rolling his eyes manner and said, 'this is for trade only'. I was like, 'yes'. And he said, 'well, are you trade?' I told him yes, carried on looking, and he came over and said, 'excuse me, do you ACTUALLY have a shop?' err, see ya! Not that it matters to you matey! I assume it was because I weren't over 30 with my own snooty demeanour. I find many people don't take me seriously because I look about 18. That can be quite tiresome! The shop's going to be in Hull. Eventually I'd love to have lots of boutiques and definitely be online, but I've found from another venture I've done (www.tattielashes.com if you're interested) that a website is a whole other full time commitment, so for now I think I'll make things available to buy via the blog. Your job sounds fun, and it'll be good if you get to have a decent amount of input…I'll be interested to see what ideas you come up with, keep me posted on that too! the gladiators are so cool…!